Objective: To evaluate the effectiveness of a preseason physical training programme that taught landing and falling skills in improving landing skills technique and preventing injury in junior elite Australian football players. Methods: 723 male players who participated in an under 18 elite competition were studied prospectively in a non-randomised controlled trial over two consecutive football seasons. There were 114 players in the intervention group and 609 control players. The eight session intervention programme taught players six landing, falling, and recovery skills, which were considered fundamental for safe landing in Australian football. Landing skills taught in these sessions were rated for competence by independent and blinded assessors at baseline and mid-season. Results: Evaluation of landing skills found no significant differences between the groups at baseline. Evaluation after the intervention revealed overall improvement in landing skills, but significantly greater improvement in the intervention group (z = −7.92, p = 0.001). Players in the intervention group were significantly less likely (relative rate 0.72, 95% confidence interval 0.52 to 0.98) to sustain an injury during the season than the control group. In particular, the time to sustaining a landing injury was significantly less for the intervention group (relative rate 0.40, 95% confidence interval 0.17 to 0.92) compared with the control group. Conclusions: Landing and falling ability can be taught to junior elite Australian football players. Players in the intervention group were protected against injury, particularly injuries related to landing and falls. Injury prevention studies have shown that it is possible to teach landing techniques11 and that physical training programmes can reduce injury incidence.12 Together, these studies provide impetus for investigating an injury prevention strategy at the elite junior level of football with a focus on landing skills. The aim of this prospective controlled trial was to teach landing and falling skills to elite junior football players, and to evaluate the effect of the programme on landing skill performance and the injury profile of this population. Sixteen teams from the elite under 18 national football competition in Australia were invited to participate in this pilot study. The study was approved by the university human ethics committee. Before participation, informed written consent was obtained from all participants and their parent or guardian. The study was conducted over two seasons (2002 and 2003). Each season consisted of 18 matches, and each week, 22 players from the squad were chosen to compete for each team. Three teams opted to receive the landing and recovery training programme (intervention teams) and the remaining 13 teams who did not receive the intervention completed normal training and competition and thus formed the control group. There was no randomisation of teams into intervention and control teams. One team chose to receive the intervention in 2002, and the 2002 injury data were included in the intervention group. This team chose not to receive the intervention in 2003. Owing to the age restrictions of the competition, only 19 players from 2002 continued in 2003. However, to avoid contamination, the data for these 19 players were excluded. Data for the remaining players in this team who played in 2003 who had not received the intervention were therefore able to be included in the control group. No player was included in the study for more than one year. The intervention13 consisted of eight 30 minute sessions delivered weekly as part of team preseason training. Six landing, falling, and recovery skills (prone fall, backward fall, left and right sideways rolling, two foot landing, and back shoulder roll) were taught. The skills were initially performed indoors on mats, and then incorporated into game situations on the football field. No injuries occurred during the implementation of the intervention programme. There was no record of attendance at intervention sessions, but, as players were expected to maintain a high level of commitment at this level of competition, they are likely to have attended most sessions. Preseason training is consistent across teams at this level, consisting of three sessions a week, each of two hours duration, and includes aerobic endurance activities, weight training, and skill acquisition. To examine the effect of the intervention on the skills, a subset of football players from the intervention and control groups were videotaped completing the six skills before and after the intervention. Testing conditions were standardised. Players completed the skills indoors and received standardised instructions and a demonstration of each skill before testing. Players did not receive feedback on their performance, nor were they permitted subsequent attempts. Each player’s performance of each skill was scored by two independent expert assessors who had extensive experience in gymnastics and landing techniques, and who were blinded to the allocation of the players to the arms of the controlled trial. The assessors rated the skills (of both intervention and control players) on a scale of 1–5 (1, skill not evident; 2, some evidence of the skill; 3, average skill; 4, skill evident; 5, consolidated skill.) Objective guidelines were provided to the raters according to factors specific to each skill, including point of contact, force dissipation over time, range of motion used to absorb force and maintenance of body form throughout the skill, and ability to recover balance. Injury and game exposure data were collected for each player for the 2002 and 2003 seasons. An injury was defined as any incident occurring during a football game or training session that resulted in a player missing one or more elite competition games.14 Injuries were defined as mild (one week duration), moderate (two weeks), and severe (three weeks or more) to be consistent with the senior Australian football data collection. A standardised injury sheet was completed by club medical personnel (team doctor, physiotherapist, or sports trainer). This sheet recorded the body part injured, how the injury occurred, the type of injury sustained, the date of injury, the quarter of match play in which the injury was sustained (if relevant), protective equipment worn, and treatment obtained. Player participation in football (exposure) was monitored using a tool termed a player movement record. Each week, whether players were competing for their elite competition team, their local club, or their school, or if they were injured, ill, suspended, or absent for another personal reason was recorded. Participation in training sessions during the season was not recorded for pragmatic reasons. The player movement record was completed by a club official and documented game participation and reasons for absence for all players at each club. It was used to cross check with the injury forms to ensure that a form was completed for all injuries meeting the injury definition. All data were analysed using SPSS (version 11.0). Heidt et al12 conducted a physical training intervention in a cohort of soccer players and showed a reduction in injury incidence in the intervention group (14%) compared with the control group (34%). From these data, an effect size of 0.58 was estimated. Using a two by two contingency table, a sample size of 26 was required for each group of this study. A non-directional analysis, with an α level of 0.05 and 26 subjects yields a power of 0.70. As the sample size of each group was greater than 26, the power was improved. However, as this investigation was a pilot study, the initial power calculation was considered adequate and not recalculated. The relative risk of sustaining a landing injury was calculated from the number of landing injuries sustained by the intervention and control groups. Independent t tests or Mann-Whitney U tests, depending on the distribution of the data, were used to compare the groups with respect to continuous variables. χ2 analysis was used to test for association between categorical variables and the study group. The level of significance was set at p<0.05. Cox proportional hazards regression was used to compare the groups with respect to the following outcomes: (a) injured during the season; (b) body contact injury; (c) landing related injury. For the outcomes of body contact and landing injuries, the players were considered to be an injury case if the body contact or landing injury was the first injury sustained during the season. All other cases were censored. Uninjured players were considered censored, with the point of censorship considered to be the end of the season for all uninjured players and the time of first injury for those who did not sustain a body contact injury (for the body contact injury model) or landing injury (for the landing injury model) as their first injury. Weeks to injury was chosen as the time variable. For each model, the relative risk (RR) and 95% confidence interval (95% CI) were calculated for the intervention group relative to the control group. Kaplan-Meier curves were used to provide a graphical representation of the relation between study group and time to the outcome of interest. The agreement between skill raters was assessed using the κ statistic. A total of 723 football players participated. There were 114 players in the intervention group and 609 in the control group. There was no difference between the study groups with respect to age, height, and weight (table 1). Significant overlap between the 95% CIs for win/loss ratios suggests no significant difference in the overall performance between the intervention and control teams (table 2). To assess inter-rater reliability, assessor ratings of each skill at the post-intervention time point were compared using the κ statistic. The two independent raters showed moderate to excellent agreement. κ Statistics ranged from 0.41 (95% CI 0.20 to 0.63) for the prone fall skill to 0.96 (95% CI 0.88 to 1.00) for the shoulder roll. There were no significant differences between the intervention and control group for any of the skills at baseline (z = −0.77, p = 0.39; table 3). Both groups improved from baseline to mid-season, but the intervention group improved significantly more than the control group (z = −7.92, p = 0.001; table 3). During the season, 396 injuries were sustained by 323 players. Injuries were mainly to the lower limb (n = 236, 59.3%), and the most common types of injury sustained were joint sprains (n = 141, 35.3%), followed by muscle strains (n = 81, 21.5%). The types of injury sustained were similar across the intervention and control groups. For example, sprains comprised 35.8% of control injuries compared with 34.8% in the intervention group, and strains comprised 21.8% of the control injuries compared with 21.2% in the intervention teams. Table 4 shows a summary of mechanisms of injury, injury severity, injury site, and availability for selection for each group. Injuries sustained at training and competition and severity of injury were similar between the groups. It is evident that most injuries were sustained during competition. These data are comparable to those for senior football and similar between intervention and control groups. The rates of injury for the control and intervention groups were 38.51 (95% CI 34.04 to 42.98) and 26.33 (95% CI 18.28 to 34.38) injuries per 1000 hours respectively. Players in the intervention group were significantly less likely (RR 0.72, 95% CI 0.52 to 0.98) to sustain an injury during the season than the control group (fig 1). 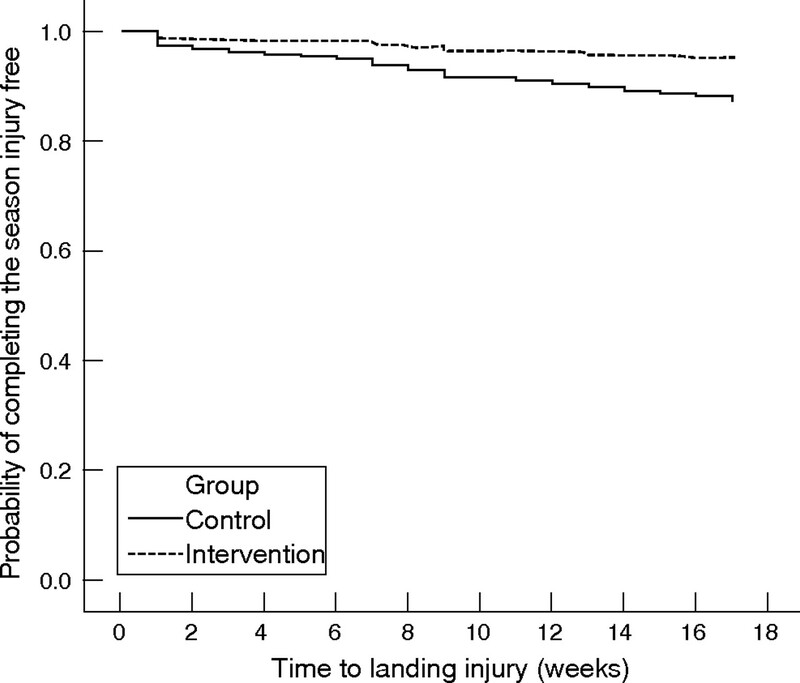 In particular, the time to sustaining a landing injury was significantly less for the intervention group (RR 0.40, 95% CI 0.17 to 0.92) compared with the control group (fig 2). 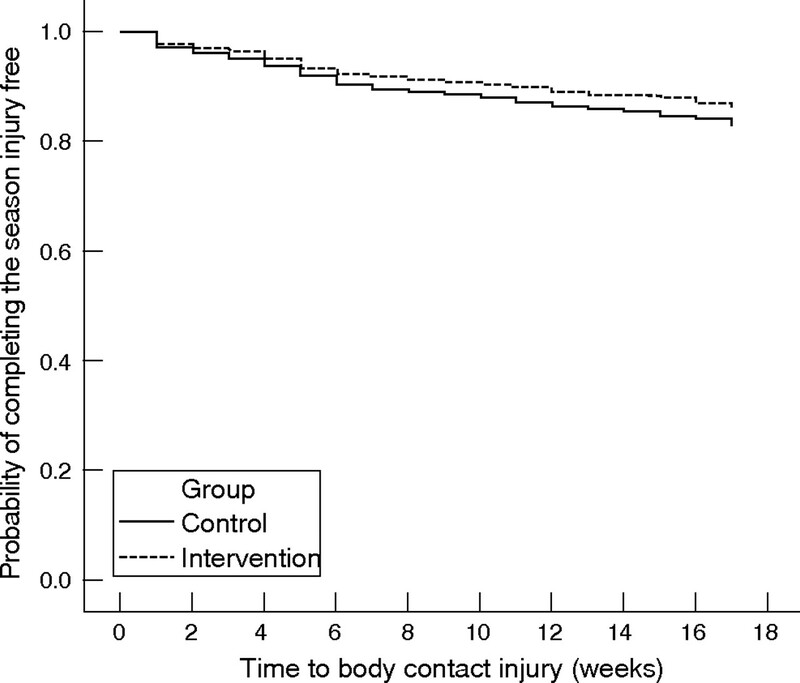 Although the RR of sustaining a body contact injury was lower for the intervention group, this was not significant (RR 0.79, 95% CI 0.47 to 1.34). Figure 3 shows the relation between the probability of completing the season body contact injury free and the study group. Kaplan-Meier curve for time to sustaining an injury by trial group. Kaplan-Meier curve for time to sustaining a landing injury by trial group. Kaplan-Meier curve for time to sustaining a body contact injury by trial group. There was no difference between the study groups with respect to injury severity, as measured by the number of weeks missed due to injury (z = −0.86, p = 0.39). Similarly, the number of players unavailable for selection each week was not different across the groups (z = −1.64, p = 0.100). Injury prevention at the junior level of football is warranted because of social and economic implications of youth sports injury.10,15,16 This is the first study to investigate a landing training programme as an injury prevention strategy in elite junior Australian football. It evaluated both the ability of the intervention to improve landing skills and its effect on injury incidence. The intervention resulted in a significant improvement in player landing skills and was effective for preventing injury, particularly landing related injuries. Although both groups showed a significant improvement in landing skills over the eight week time period, the intervention teams improved significantly more than the control group, indicating that landing and recovery skills can be taught and that the intervention used in this study was successful in doing so. Both groups improved from baseline to mid-season (after the intervention), so it would appear that natural skill acquisition occurs as a result of training and football competition. However, the fact that the intervention group improved significantly more infers that the intervention taught the players landing skills beyond the natural training progression. From this, it is reasonable to assume that the difference in skills between the two groups was an important factor in reducing injury rates. 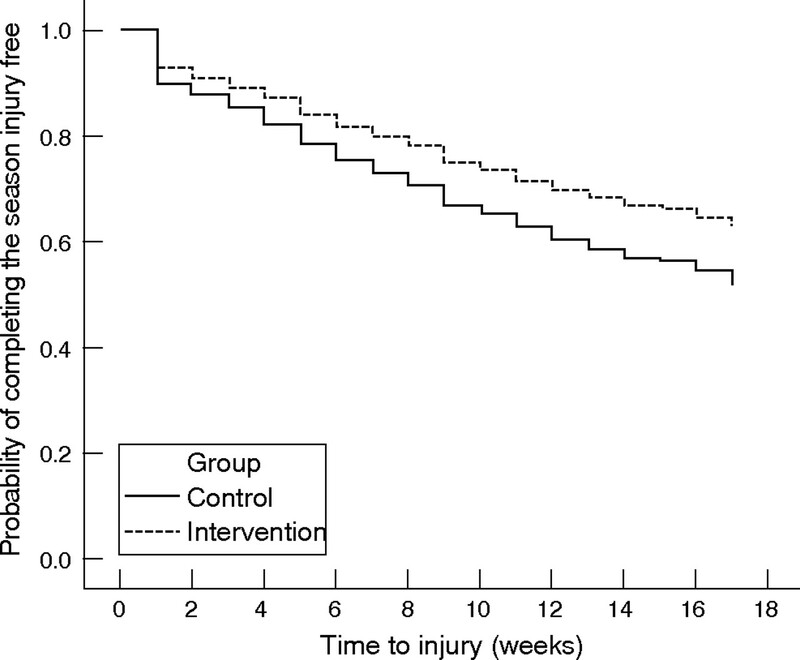 Overall, players in the intervention group were significantly more likely to complete the season injury-free than those in the control group, a pattern noted across the full season (fig 1), despite the intervention only being undertaken during the preseason. In particular, the intervention was most effective for preventing injuries related to landing and falling, and the protective effect identified was probably due to the acquisition of better landing skills. Landing and recovery skills are fundamental to football, and safe execution of these skills appears to reduce injury. In contrast, there was no significant reduction in body contact related injuries in the intervention group, an area not targeted by the exercises included in the intervention programme. In Australian football, injury incidence is highest at the beginning of the season, and a lack of match fitness has been suggested as an explanation for the high number of injuries in the first few games of a football season.18,19 Match fitness does not refer to any one variable such as cardiovascular fitness, but rather the combination of intensity, physical, emotional, and psychological factors that contribute to a player’s ability to compete at their optimal level. Potentially, the intervention trialled, and its component skills, may have resulted in improved preparedness of players for competition through better landing strategies and basic skill performance. The programme may have accelerated the acquisition of the natural improvement seen in the control group, enabling them to obtain a higher level of skill performance. Although this study has shown that a preseason intervention aimed at improving landing and falling skills can prevent injury in Australian football, several limitations must be acknowledged. Firstly, the criteria used to describe injury severity are rarely consistent across studies.20 Injuries were only recorded if they resulted in at least one missed game, thus minor injuries were not recorded. Nevertheless, all injuries meeting the definition were captured, and the definition of injury used was consistent with previous elite level studies. Despite the high level of commitment expected at this level, attendance at preseason training was not recorded and may have affected the results. Another limitation was the inability to collect training exposure data. The possibility that differences across the control and intervention groups with respect to training participation may have impacted on injury risk and incidence could not be eliminated. Given that training injuries were similar, and that, at this level of competition, training loads can be expected to be similar, it seems likely that training exposure would not have affected the outcomes of the study. Finally, the intervention and control groups were not randomised. There is the potential for self assignment bias. Clubs volunteering for the study may be more eager than others to take injury prevention measures (including carrying out the landing and recovery programme) and therefore tend to have less injuries or be more successful. Randomisation of the clubs or within clubs—that is, half of the club’s players allocated to each intervention arm—would have provided a greater level of evidence of the effectiveness of the intervention. However, comparison of the players in each arm revealed no obvious biases despite the lack of randomisation. The win/loss ratio was chosen as a surrogate marker of team performance, and results for both the intervention and control teams were compared and revealed no significant differences. In addition, there were large subject numbers and a prospective design. This study has investigated an injury prevention strategy for elite junior Australian football players and evaluated the effect of the intervention on the incidence of injury. It found that landing and falling ability can be taught to junior elite Australian football players and that players in the intervention group were protected against injury, particularly injuries related to landing and falls. This type of intervention may be appropriate for other sporting populations where injuries related to landing and falls are common. Statistics Australian Bureau of Statistics. Sports Attendance, Australia. Canberra, 2003. http://www.abs.gov.au/Ausstats/abs@.nsf/0/9FD67668EE42A738CA2568A9001393AC. Gabbe B, Finch C, Wajswelner H, et al. Australian football: injury profile at the community level. J Sci Med Sport 2002;5:149–60. Orchard J, Wood T, Seward H, et al. Comparison of injuries in elite senior and junior Australian football. J Sci Med Sport 1998;1:83–8. Baquie P, Brukner P. Injuries presenting to an Australian sports medicine centre: a 12-month study. Clin J Sport Med1997;7:28–31. Boden BP, Griffin LY, Garrett WE Jr. Etiology and prevention of noncontact ACL injury. Phys Sportsmed2000;28:53–60. Dicker G, McColl D, Sali A. The incidence and nature of Australian Rules football injuries. Aust Fam Physician1986;15:455–9. Lloyd DG. Rationale for training programs to reduce anterior cruciate ligament injuries in Australian football. J Orthop Sports Phys Ther2001;31:645–54. Grimmer KaWJ. Injury in junior Australian Rules footballers. J Sci Med Sport2003;6:328–38. Jones D, Louw Q, Grimmer K. Recreational and sporting injury to the adolescent knee and ankle: prevalence and causes. Aust J of Physiother2000;46:179–88. Waddington G, Seward H, Wrigley T, et al. Comparing wobble board and jump-landing training effects on knee and ankle movement discrimination. J Sci Med Sport 2000;3:449–59. Kidskills. IMPACT—Injury Minimization and Performance enhancement ACTivities. http://www.kidskills.com.au/ (accessed 18 Aug 2006). Orchard J, Seward H, McGivern J, et al. Intrinsic and extrinsic risk factors for anterior cruciate ligament injury in Australian footballers. Am J Sports Med 2001;29:196–200. Chalmers DJ. The public health impact of sports injuries. The impact of sports injuries: mplications for prevention. 5th I0C World Congress on Sports Science, Sydney 1999. Yeo JD. The financial burden of catastrophic sports injuries. The impact of sports injuries: implications for prevention. 5th I0C World Congress on Sports Science, Sydney 1999. Sheth P, Yu B, Laskowski ER, et al. Ankle disk training influences reaction times of selected muscles in a simulated ankle sprain. Am J Sports Med 1997;25:538–43. Gabbe B, Finch C, Schokman P, et al. Tackling Australian Football injuries: a review of the literature. Report no. 98003. Deakin University School of Human Movement 1998. Scanlan A, MacKay M, Reid D, et al. Sports and recreation injury prevention strategies: systematic review and best practices. Systematic review and best practices. Ontario: BC Injury Research and Prevention Unit, 2001. Chomiak J, Junge A, Peterson L, et al. Severe injuries in football players. Influencing factors. Am J Sports Med 2000;28 (suppl 5) :S58–68. The study presents some important information from two perspectives. Specifically, a countermeasure has been investigated in a field setting and has been shown to be effective. More generally, the study is an example of the type of intervention studies that are needed to progress the overall field of sports injury research. The study has a sound epidemiological base and, although it contained some methodological limitations, attempted to explore the impact of interventions in a field or real world setting. The results of the study may influence the coaching of junior elite Australian rules footballers and also encourage more researchers to implement field based intervention trials.